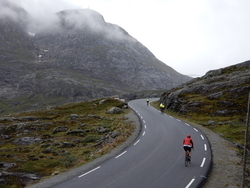 Straight into our top 5 - goes this wonder ride in Europe's all new wonder cycling destination. Combining stunning coastline, the incomparable Ocean Road, viking villages nestled around pretty harbours, and the awesome Troll's Staircase - this is one ride you shouldn't miss out on. Take all this and add a certain Scandinavian 'je ne sais quoi' and you've got it - Adventure Cafe's pick of 2018! We shall fly into the regional airport of Alesund, and stay overnight here and prepare for the incredible ride that lies ahead for us. From Alesund, we shall ride up the Coast, heading north through a series of amazing bridges, coastal roads, and short ferry rides. 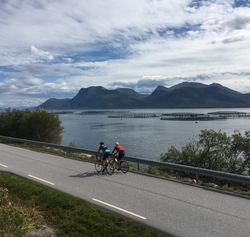 We pass through the pretty overnight stop of Mold - before Day 2 of the ride - where we hit the amazing Atlantic Ocean Road and its impossibly beautiful and spectacular route across this pretty archipelago of islands. We reach the town of Kristiansund for a perfect overnight after a perfect day's riding. From Kristiansund we turn south and head towards the Troll's Staircase - the famous alpine switchback road tucked in this hidden corner of Norway. Our next overnight is in Andalsnes - just at the foot of the climb. On the last day, we shall cross the high plateau, before dropping down beside the fjord opnce again and back into Alesund to complete this perfect circuit. The only question you'll have by the end is, "why didn't I come here sooner" ? We shall arrive on day 1 - we shall either meet at the airport or our confirmed joining hotel. We set off riding on day 2, riding for 4 days. Our ride is circular - returning back to the same starting hotel - meaning that we can leave our bike boxes / cases / bags. Day 6 is departure day. 3/4 star hotel accommodation - of an excellent standard. We shall be using Twin and Triple rooms through the trip and making the most of the local hospitality. This trip is designed to be of a high standard in the evenings. You should note that Norway is more expensive than the UK - and drinks and dinners will be more expesnive than normal. Please be sure to budget for this. Experienced Cycle Leader, Full Vehicle Support and Driver/Mechanic, Qualified First Aider, Pre-event briefing, Bed and Breakfast accommodation en route, Full buffet breakfasts every day. Your evening meals and lunches. Return flights. Travel to and from start and finish. Ferries and Tunnel Tolls. Weather conditions very similar to England - dependent upon time of year could be cold, hot or rainy. Prepare for all conditions. We normally plan to ride this route in mid summer - when daylight is plentiful - we may well emerge from dinner to find broad sunshine at 10 o clock at night! It may be possible to organise a hire bike for this challenge - BUT Adventure Cafe can only organise a very small number of hire bikes - as we shall bring them from our UK base. Therefore if you need one - please contact us and request one as soon as possible.